Meet Oli Truss. She’s an eccentric ex-headmistress in her nineties, who now lives isolated and housebound in her condemned country cottage, her companions being a cat, a dog, and a small Shetland pony named “Baby”. The cottage has rats, the floor is littered with animal droppings, cobwebs decorate the windows, and maggots squirm in leftover food in the kitchen; but Oli won’t hear of leaving her home. Happy on her own, she gets up every morning around 7:15 for a biscuit, and a cup of tea – when she can find her cup, that is. As the water runs nonstop in the sink, Oli wonders why the empty water pot on the counter is not boiling, admitting that “I can’t always think quickly like I used to”. She accepts the bare minimum of help home care workers on the first floor, as the second floor is now off limits to everyone. At what point is further intervention mandatory? Should she be allowed to live life her way? 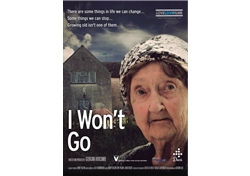 Not easily forgotten, “I Won’t Go” paints an intimate and representative protrait of countless older adults whose only “crimes” are growing old, and wanting to keep their independence – at all costs. Oli’s story brings home the complex issues of self-neglect, competence and capacity, the innate desire for independence, and the right to live and die at home with dignity. A must-see for all social, legal, law enforcement, mental health, and geriatric services providers.